Peanut Butter lovers rejoice! 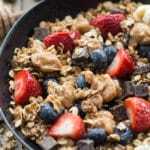 This Dark Chocolate Peanut Butter Granola has only 8 ingredients, and bakes up sweet, salty and delicious in just 20 minutes. The hardest part will be letting it cool before you eat it! In a large bowl, stir together the oats, peanuts, coconut sugar and salt. Stir in the melted coconut oil. In a small microwaveable bowl, add the peanut butter and 2 tbsp of honey. Microwave for 30 seconds, or until mixture easily stirs together. Add to granola mixture and stir until well combined. You may need to use your hands to ensure the peanut butter/honey mixture is well incorporated. Spread the mixture out on the prepared baking sheet and press down on the mixture. Drizzle the additional 1 tbsp of honey over the mixture. Bake for 18-20 minutes, or until the mixture starts to brown on the edges. Do not stir while baking. Remove from oven and let cool completely on the pan. The granola will get crunchy as it cools. Once cooled, stir in the chocolate chunks. Store in an airtight container or resealable bag on the counter. The granola should stay fresh for about 5-7 days. I use gluten-free rolled oats (Bob’s Red Mill), but you can use any kind of rolled oats. If you use salted peanut butter, just reduce the amount of salt you add to the granola. For the granola bowl photographed in this post, I topped the granola with some almond milk, blueberries, strawberries, bananas, chia seeds, peanut butter, and a drizzle of honey.